"The Sunshine State" is Florida's official state nickname because of the many sunny days in Florida. It was adopted by the 1970 Legislature. 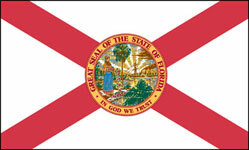 Florida was admitted to the U.S. as a State on March 3, 1845 as the 27th state. Florida actually means "full (or feast) of flowers" named by explorer Ponce de Leon because of all the flowers he saw when he landed here in 1513. Florida's semi-tropical climate allows it to have year-round flowers and lush vegetation.